I'm sure somewhere will print it for you. Maybe try to print a smaller copy of the silver version (i.e. without copyright/trademark/reserved logos) and if they accept that, you could photoshop out the c/t/r logos from the gold versions and maybe they would accept it then. I'm sure there's a way, even if with someone other than walmart. These signs are great. Has anybody printed them on 4x6" photo paper? I only have a small area that I want to use to display. 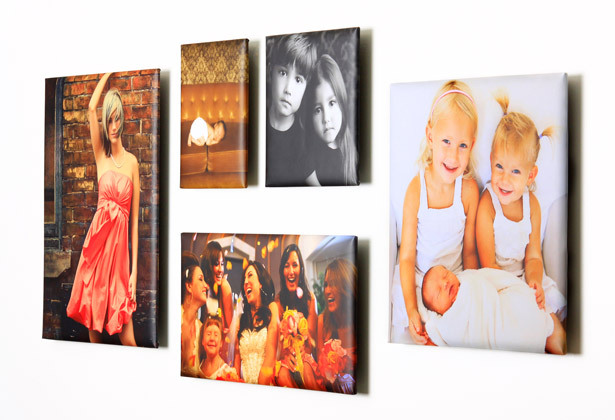 My idea is to get a vertical frame that holds 3 or 4, 4x6" photos and display them in a single frame. Would printing them on 4x6 paper make them distorted? Scaling them to 4x6 would either distort them or add wider black borders on the sides. 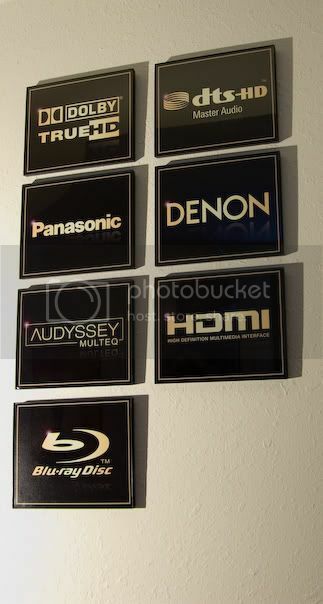 I'm not sure if you do much photo editing, but it wouldn't be very difficult to extend the gold frame to match the aspect ratio of 4x6 without distorting the actual logos. I was planning on doing the exact same thing as you, except with 6x8, but finding a horizontal or vertical multi-print frame for 6x8 proved nearly impossible. I am going to pick up some 4x6 photo paper today and try it. My photoshop skills aren't the best, it may be easier just to crop the frames out. I would like to go a little bigger, but like you said finding proper multi-print frames is impossible. Here is the little project I did. I picked up the frame at Wal-Mart, I went with a frame that holds nine 4x6 photos. I need to take it down and reframe some of the photos, some of them did not get framed straight. Can you please make a sign for "The Boricua Family Theater"
Did you just save them on cd or drive and have them printed at Costco or did you have to edit or do anything to them? So they can be done as an 8 by 10 without any distortion? I just sent them as is through Costco's website. The only slight problem I had was that the gold border around each image is slightly visible in the 8 x 10" frame. Although if I cared, I could Photoshop that out. Hey i would like to put out a request for "Energy Loudspeakers". You pretty much have everything I want except that. Got Plasma?!?! Crush the LCD propaganda!! Your pictures are amazing, thank you. 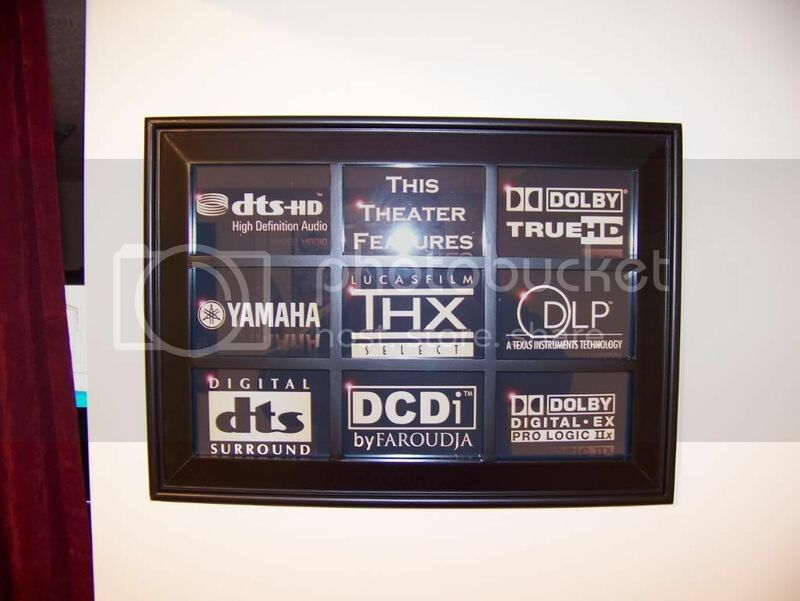 I wanted to ask if you plan to have a gold version of the dolby digital pic the same as #74 in the aluminum on black set. Thanks again. Is there a SACD sign? I couldn't find one. mheadroom, kudos on the great work!! Please make a Carver Amps sign. Thanks a million! sorry about the delay in response. Life has been busy due to moving and I still haven't setup my computer with all the files. I'll try to get to the requests within the next week or so. Glad everyone is enjoying the signs! Great work. Fantastic pics. Can you please add Tannoy and Audioquest. Cheers from the Great White North. Great signs. The detail which appears when the gold on black signs are backlit is amazing. I just wanted to throw out there, that some print shops offer a metallic paper. It looks a lot like regular glossy, but has a very special reflective property that can really make pictures POP when the light hits them just right. These might look really good printed on metallic paper. Also, you can get prints bonded to different types of backer boards with a protective UV coating (masonite, styrene, etc.) if you want to go for a more commercial look and don't want to put them in frames. I personally print all my stuff at www.WHCC.com although it is more geared for working photographers as they require you to setup an account with a credit card, etc. They don't have any minimum monthly or annual quantities, there only requirements are a minimum of $14 per order. Another place that offers more commercial services would be www.mpix.com I have never used them, but a lot of photographers are happy with their capabilities. I don't know if these guys would refuse to print them or not. They are pro print houses and they just expect that you hold the copyright, or proper release from the copyright holder, for any print you submit to them. You may find printing to any print house other than the minimum wage workers at Target and Costco to refuse to run them. Even if these are made from scratch and not physically copied from some other sign, it is still technically copyright infringement and a lot of places have provisions to deny illegal copying. Anyway, just throwing that all out there. I was very interested in combining the Float Wrap and Metallic with black/gold signs... until I saw the price. I currently have Wal-Mart prints in thick black wood Wal-Mart frames and the total for 5 signs was around $25. The Float Wraps in Metallic would be $31.75 EACH. That's a little pricey for a DIY project, at least around my house. That said, regular 8x10s are something around $2.50 a piece. Mounted to ¼ foamboard it would run you under $6 if memory serves. I honestly don't know how well the floating wraps would look for this application, but if you had the right space, you could do a 10x20 with three logos vertically or horizontally. Or even a 16x16 or 16x20 with 4 logos in a box shape. Then be out the door for under $60. As I said, I haven't printed any of them myself, but I am itching to find need to print one. I would also say that WHCC allows you to print 4 free 8x10s (luster paper) when you sign up. So that you can confirm your monitor calibration syncs up with their printer profiles (if any of that makes sense to anyone.) At least they did a while back, I assume they still do this. Lastly, I would not recommend the standout mounts in smaller sizes like this. It just doesn't look professional. On larger prints (say 16x20+) its starts to look ok for applications like temporary displays and such, but even then I would not find it suitable for permanently mounting on a residential wall. Fantastic idea and many thanks for taking this on as I know it's extremely time consuming. Couple of quick questions... are you using Photoshop to generate the images? If so, would it be possible to publish the actions, font, lighting elements, etc so folks can mix and match or even generate custom images? Could you create a sign that says "Knights Theater" in black and gold? Thanks for the time and effort Mheadroom on these images. Where is everybody getting theres printed at without worring about copyright? Walmart? Walmart printed mine from an SD card with no issues... none had the (C), (R), or TM logos on them, so the software may be scanning for that. 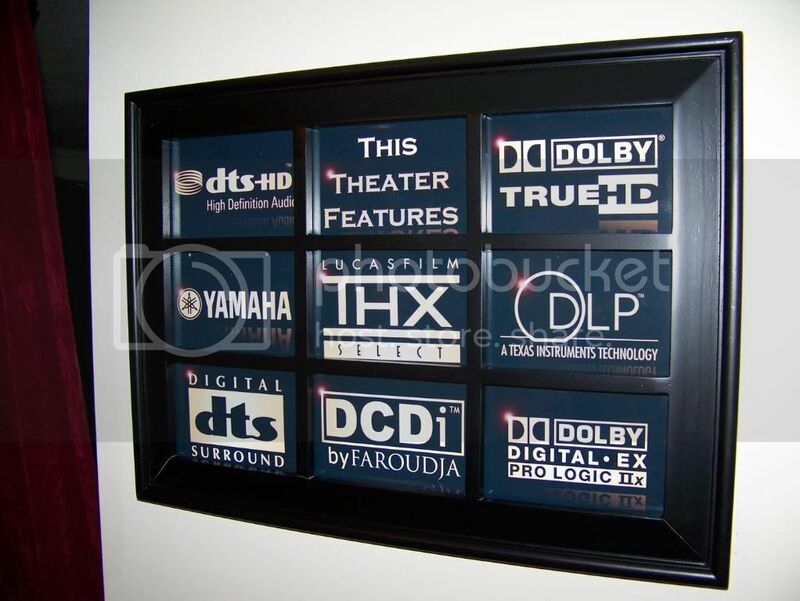 Thanks Stephen will give Walmart a go, BTW would you happen to have the image file for the Dolby Tru HD and DTS HD combo you've got printed up in the 1st page (bottom left sign)? Couldn't find it on the site and would really like to use that one. Right on, had you not mentioned and even then I couldnt even notice. Heh. If you cant get it for some reason I guess I could ask the OP if he'd whip something up. But yours looks good. 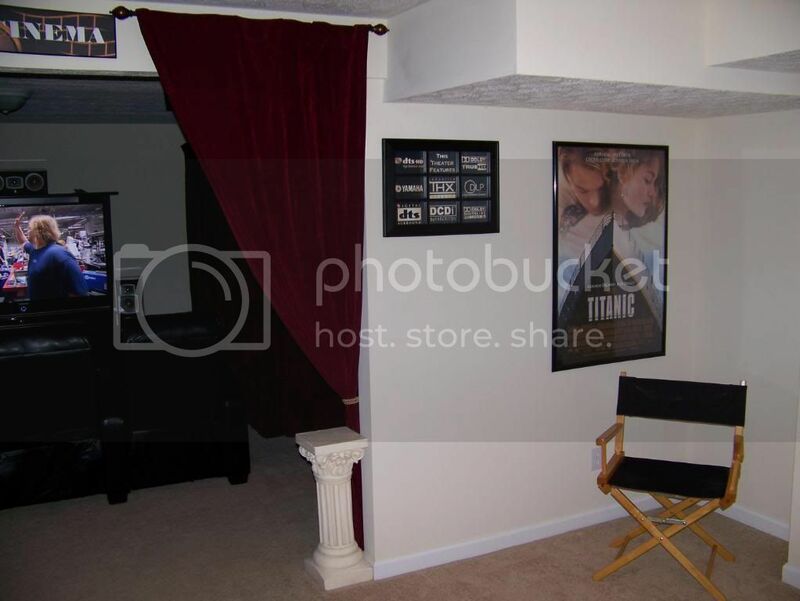 Any chance I can have the "WELCOME TO THE HAWK'S THEATRE ROOM" or "WLCOME TO THE HAWK'S CINEMA" in Gold on Black? Also, can you make the Full 1080 sign in gold on black also please? Really great work, btw! I have been looking for something like this for about a year, and almost bought some stuff on ebay, but this looks a lot better! THANK YOU! I will make a donation soon!